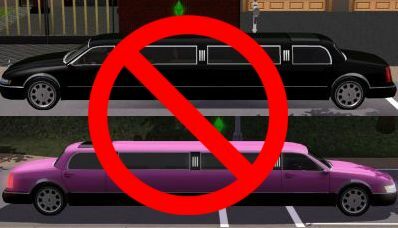 This mod removes a number of limos that sims use when traveling around town. If you are having trouble with too many limos in your town, you can use this mod to drastically reduce the number of limos that sims are using. The .01% chance that an NPC will use a limo instead of a generated ownable car based on career level has been change to 0%. Limos used to pick up sims for Prep school boarding school. Possibly some career limos that are in the Careers XML (Fortune Teller career and Film career). I am hesitant to alter this XML due to high chances of conflicts. If you ask me enough, I might do it anyhow. If you wish to remove the limos listed above, use: Nona_NoLimo_CareersPlus. This mod removes a number of base game limos, as well as limos for Showtime and Late Night. However, no expansion pack is required. This mod is highly likely to require an update for every major patch. Please do not use this mod with any patch level except 1.63 unless otherwise noted. If you patch before I am able to update, remove this mod from your mods folders. If you want me to combine this mod with another that you use to have functionality of both, let me know.